Jason Vargas took the mound on Monday afternoon against the Miami Marlin and continued to show that last season was a fluke season. The veteran lefty pitched 2.1 innings while allowing four hits, walking one but zero earned runs and striking out two. 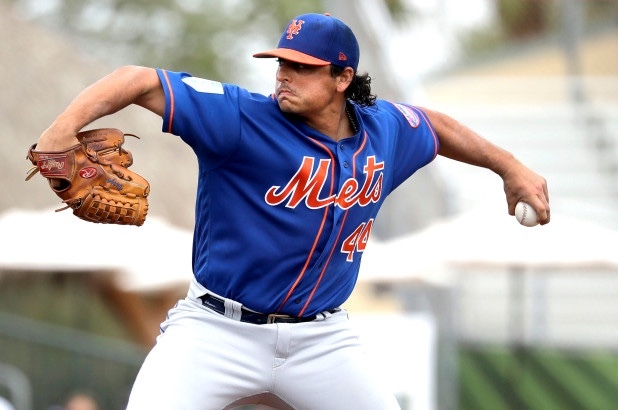 The Mets may be considering other options, outside the organization as well as in-house however, Jason Vargas plans to make it a tough decision for the Mets front office. Left handed reliever Luis Avilan came on to pitch 1.2 innings while striking out four Marlins and only allowing one hit and no earned runs. Avilan is another lefty that is working extremely hard to crack the 25-man roster. Edwin Diaz followed with a scoreless frame, of his own. The closer struck out two and gave up a hit before retiring the side. KRobert Gsellman came onto pitch two innings and gave up an unearned run, and only struck out one batter. On he offensive end, J.D. Davis continues to make a case for serious playing time during the regular season, as he doubled in Danny Espinosa with a line drive out to centerfield. Speaking of Espinosa, who’s battling Adeiny Hechavarria for a bench role, worked out two walks in his three at bats. The Game is currently tied 1-1 in the seventh, more details to come soon.